As humans, we experience an amazing world of colour, but what can other animals see? Some see much more than us, but how they use this vision is largely unknown. We see what we see because our eyes have three photoreceptors, red, green and blue. Our vision is good compared to dogs which have only two photoreceptors (green and blue), but is nothing compared to many birds who have four photoreceptors: ultraviolet (UV) as well as red, green and blue. The addition of a UV photoreceptor is hard to imagine, but if we consider invertebrate vision it gets even more mind-boggling. Butterflies have five photoreceptors, providing them with UV vision and an enhanced ability to distinguish between two similar colours. Octopuses do not have colour vision but they can detect polarised light. Light is made up of waves and polarised light is when these waves all vibrate in the same plane. The closest humans come to seeing polarised light is by wearing polarised sunglasses. But this is not the end of the story. Mantis shrimp vision puts everything else to shame. These marine crustaceans may be well-known for their record breaking punch (the same acceleration as a .22 calibre bullet), but they also hold the world record for the most complex visual system. They have up to 16 photoreceptors and can see UV, visible and polarised light. In fact, they are the only animals known to detect circularly polarised light, which is when the wave component of light rotates in a circular motion. They also can perceive depth with one eye and move each eye independently. It's impossible to imagine what mantis shrimp see, but incredible to think about. Mantis shrimp have compound eyes that are made up of tens of thousands of ommatidia (elements containing a cluster of photoreceptor cells, support cells and pigment cells) much like flies. In the species with spectacular vision, Gonodactylids and Lysiosquillids, the middle of the eye has six rows of modified ommatidia called the mid-band. This is where the magic happens. Each row is specialised to detect either certain wavelengths of light or polarised light. The first four rows detect human visible light and UV light. In fact, each row contains a different receptor in the UV, giving mantis shrimp extremely good UV vision. The ommatidia of the last two rows contain very precisely positioned, tiny hairs. This arrangement is most likely responsible for their polarisation vision. The overall structure of the eye is intriguing too. Three parts of each eye look at the same point in space. This results in about 70% of the eye focusing on a narrow strip in space, but also gives them the ability to perceive depth with just one eye. To create an image using this strip, mantis shrimp are constantly moving their eyes and scanning the environment. The ability to move each eye independently comes in useful here, and allows the mantis shrimp to have a large field of view. I see … but what's it for? Many animals are known to use visual signals. Female peahens prefer male peacocks with more eye spots in their train and male chameleons display dominance using brighter colours. Behavioural observations and morphology suggest that mantis shrimp are using their complex visual system for communication, too. 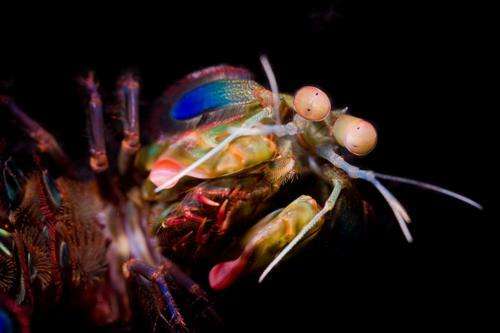 Male mantis shrimp are known to perform courtship dances to females and aggressive displays to other males. Both behaviours show off coloured patches which vary in reflectance properties (e.g. 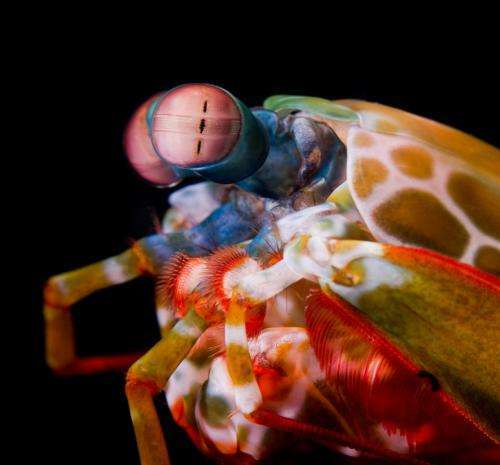 brightness, colour) across individual mantis shrimp. This suggests that flashing these patches could provide information to the receiver about the signaller. 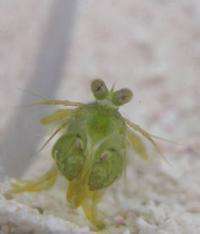 Despite these indications that mantis shrimp are using visual signals, the work on this topic is sparse. There is some research suggesting that mantis shrimp use circularly polarised light as a secret communication system and that polarised light is used in courtship. Besides this, we know very little about visual communication in mantis shrimp. How can we research this? Behavioural experiments are a fantastic way to understand how mantis shrimp communicate visually. These experiments are even more beneficial if they can be performed in the field to make sure that the behaviours are as natural as possible. To investigate the role of the coloured patches in communication, the experiments should involve altering the coloured signal and watching how this changes interactions between two mantis shrimp. So, for instance, decreasing UV reflectance may decrease the mantis shrimp's ability to win a fight against another mantis shrimp. Alternatively, increasing the brightness of a patch may make a male more attractive to a female. Because these animals have the most complex vision system in the world, it's surprising that we know so little about how they communicate visually. I intend to fill this knowledge gap with my research.